I like to eat some Turkish and Arabic meals and side dishes. I do for example like Bulgur salad. I have a Turkish fruit dealer around the corner and I know this family since a very long time. Years ago when I bought fruits, she suggested me to try her Turkish Bulgur salad. I said that it would look like Cous Cous and that I really love Cous Cous, but she replied that it would be similar, just still not the same. 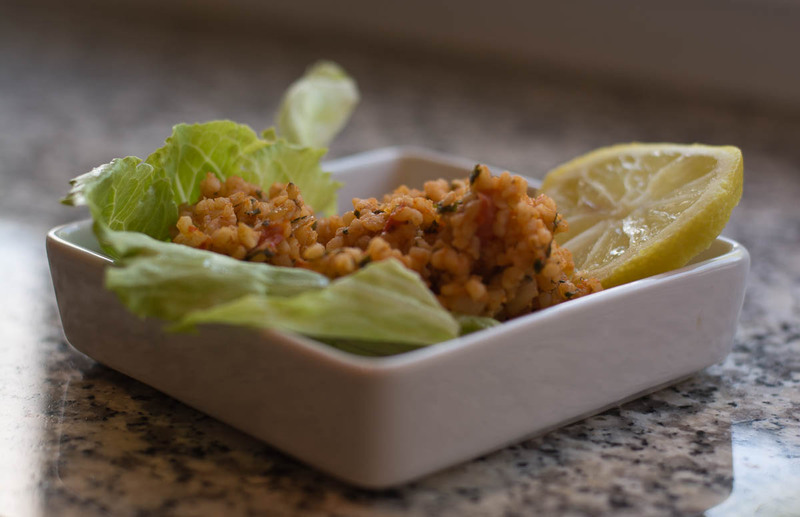 I got a small box filled with Bulgur for free, including the suggestion to put it on lettuce leafs and to squeeze a lemon out over it. Since then she got me, several times during summer I would purchase my portion Bulgur and complained with a smile that she knew how addictive it is. Friendly as they are, they said that they would have no problem to share the recipe but since I am way too lazy to be a good cook, I preferred to buy it from them. They make it fresh several times a week, and I thought they deserved the money because it’s so delicious. My wife learned how to make Lebanese food from her ex-husband’s family. I don’t know how similar that is to Turkish food but I like their Tabouli Salad, which also has bulger. Yes, if it is made right it is very good. Also, fatush is another good salad you can try.